So what should we think about the troubling news of the alleged Halloween night attack by the Tennis Channel broadcaster and ATP Board Member Justin Gimelstob? According to reports, Justin wore a costume as a Top Gun pilot in West LA and attacked Randall Kaplan from behind, hitting the venture capitalist some 50 times in front of Kaplan’s wife and child while continuously calling out, “I’m going to f—-ing kill you.” According to the LA Times, Kaplan reported that “The attack left him with ‘large contusions and bruises on my face’ along with other bruises and possibly a concussion” and that Gimelstob yelled that he would kill Kaplan. The alleged victim is reportedly a friend of Gimelstob’s estranged wife who had contacted Justin’s divorce lawyer to urge him to ask his client to stop threatening him. Justin’s father, whom he was very close to, had died just five days before the attack. Gimelstob was arrested on suspicion of felony battery and released on $50,000 bail. Gimelstob, 41, once described himself as a “serviceable player.” He reached No. 63, won two Grand Slam mixed doubles titles with Venus Williams and earned $2.5 million. At his last match as a pro in 2007, one sensed this singular man would be different. After losing to Andy Roddick at the US Open, the New Jersey native took over the on-court interview and shamelessly asked Roddick and himself clever questions. The adept go-getter soon landed jobs at Sports Illustrated.com and The Tennis Channel. There he promptly evolved into a top-level analyst with a quick mind and keen insights based on years of experience and great access. Plus, he was a witty and compelling observer. For example: Justin explained that Pete Sampras had a great serve because “when he came out of his mother’s womb, God spent a little extra time on his right shoulder.” Insiders soon realized that the New Jersey-born, UCLA educated Gimelstob, who played Davis Cup and scored wins over Andre Agassi, Andy Murray and Guga Kuerten was savvy, fearless and assertive. A gifted tennis politician, skilled networker and locker-room staple, he became friends with many, from Roddick and Federer, to Davenport and Djokovic. He briefly was a tournament promoter in LA, and eventually got elected to the ATP Board and successfully coached John Isner. He often offered comments to Inside Tennis. He drew attention when he appeared in the Wimbledon Royal Box. And he gained praise for being a loving dad and for his loyalty to his childhood tennis coach and younger brother, who were both imprisoned. 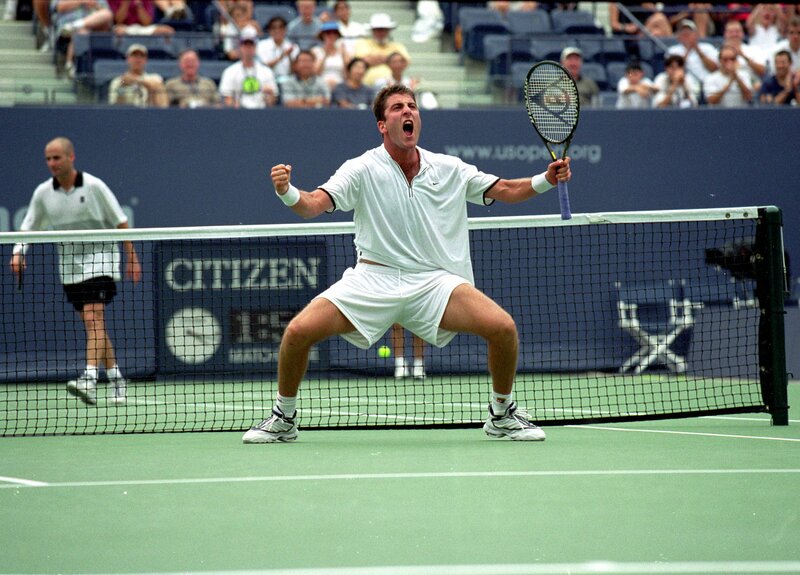 Clearly, Justin had many skills, and crafted a striking rise into the upper echelons of tennis – heady stuff. The London Times offered only a flippant response: “So long as there are women around, there will be men making titanic bloody fools of themselves.” Tennis’ response was modest. Gimelstob lost his Sports Illustrated job, and pricey USTA ads that featured him were pulled. But he soon returned to play World Team Tennis and kept his Tennis Channel position. Justin offered apologies, but some felt he didn’t really get it – he didn’t understand the magnitude of his hurtful comments and didn’t take full accountability. A spokesperson for the alleged victim, Randall Kaplan, told IT that he had received many texts, emails and calls from people describing assaults by Justin. Plus, London’s Daily Telegraph reported an incident in which “Gimelstob persued Kris Thabit, another friend of his estranged wife Cary, out of a Santa Monica restaurant in November 2016 and began an altercation which allegedly left Thabit with a cut lip.” The Telegraph also wrote that, “Gimelstob allegedly had to be pulled back by a group of players, officials and spectators after trying to choke an opponent at a paddle tennis tournament in Venice Beach…a year ago.” In another incident, Gimelstob supposedly grabbed the throat of an opponent at a paddleball tournament in Long Beach. If the charges prove true will Gimelstob follow in the unfortunate footsteps of tournament promoter Ray Moore, the London Times writer Neil Harman and the ESPN broadcaster Doug Adler, and suddenly lose his career? And, far worse, could he end up in jail? Those who care for Justin hope he somehow finally “gets it,” becomes accountable and puts his life together.